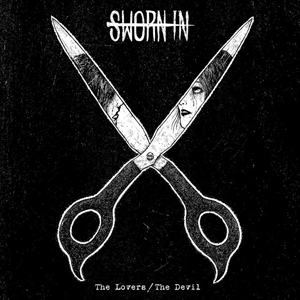 SWORN IN's new studio album, The Lovers/The Devil was released yesterday via Razor & Tie. The album was produced by Will Putney (AMITY AFFLICTION, FOR TODAY, MISS MAY I). You can check out a full stream of the album below. The Lovers/The Devil is the follow up to SWORN IN's 2013 debut album, The Death Card, which debuted on the Billboard Top 200 chart. The Lovers/The Devil, in short, is a concept record delving into the darkness of a destructive relationship. The CD is split into two halves, the first dubbed "The Lovers" and the second called "The Devil". The Lovers tells the story of the man feeling obsessed, psychotic, depressed, and drowning in unrequited love. This half of the CD covers the desperate romantic who lives inside his own head because the real world has become too unbearable. But such is life and this character reaches a breaking point. And with that, comes the split of the record. The Devil charts the course of the role reversal, where the man snaps and becomes the cold, bitter, and numb person that drove him mad, while the female occupies the position the male just went through. However, the record does not glorify self-destructive love; rather, it chronicles that situation and can be interpreted in any way that feels personal to the one listening.